We're planning a trip primarily to Tamil Nadu during September and have been trying to decide which national park(s) to visit. We won't have loads of time (~ 3 weeks) so will probably limit ourselves to just one park. We've been to Periyar (Kerala) a few years back and found that enjoyable, but fancy trying a different park in the south. 1. Is September a good/bad/mediocre time of year for Mudumalai? I get the impression that it's open all year, but obviously some times of year are better for wildlife spotting, and sometimes parks can be closed when it's too dry due to fire risks. 2. What places to stay around/in the park are worth looking into? 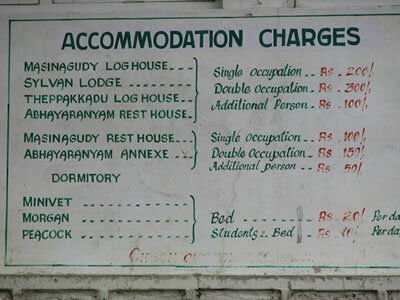 We are not on a massive budget so are definitely looking < Rs1000 per night! Has anyone stayed in the forest lodges, or is there any TTDC accomodation? 3. What are the most enjoyable ways to visit the park? I understand there's jeep and elephant safaris- but in some ways am suspicious of whether jeep safaris might consist of a miserable race along a few tracks, past a shackled elephant (that'll be Rs100 please for seeing that...) and out the park again. Are there any (guided) walking opportunities in the park? 4. Can you reach the park by public transport? I can only say that I went on a daytrip from Ooty this time last year (almost to the day!). One of the nice things was the relief fro the relatively cold weather in Ooty... We just went by car, and took a circular trip in the govt vehicle. It wasn't dramatic and we didn't see much but I still enjoyed the place and will maybe spend more time there one day. I went to Mudumalai for a day late May this year. The government rest house was all booked so had to book in a homestay. Spotting animals or going on deep trek in the forest was not on our agenda due to lack of time. Still we went into the forest by a mini-bus run by forest deptt. It goes around a well-defined path and entire circular journey took 1 hour. We spotted 2/3 wild dogs, a herd of deer, dancing peacock, all regular stuff. Anyways, we were not expecting much. They have jeep safaris which should go deep inside. We also heard treks could be arranged inside the park but can't say for sure. The thing we enjoyed most was drive on Ooty-Mysore road when it passes through the forest. Many times people spot animals beside the road only. We spotted a couple of elephants with a baby, a bison, herd of deer etc. There is not much traffic on it and vegetation around the road is so thick that it looks like wall. I could have driven on that up and down all day is time permitted. Not sure whether September is good time to spot animals but should be good immediately after monsoon or late monsoon. Park is reachable by pulic transport. Buses from Mysore to Ooty goes this way. There is a bifurcation at Mudumalai forest check-post. Either you get down there or you get down at a place called "Gudalur". Thanks for the feedback; I think we'll make a decision as to whether to go to Mudumalai or one of the other parks closer to the time, but it sounds like it could be pretty interesting. I imagine that given that it's a forest environment, seeing (large) animals can be difficult/impossible unless you go on foot or perhaps on elephant. I had forgotten taking this pic... by coincidence I came accross it last night when we were talking 'what we were doing this time last year'. There is some more information here but I didn't, at a quick look, see any useful contact numbers. how long it takes from mysore to mudumalai? is this the best/shortest way to go from bangalore (via mysore)? There are several trek operators in Masinagudi [main road of the town] who operate treks which start from the periphery but go into the core areas, I think without official permission from the forest dept. They are however quite good. Otherwise, for an officially permitted trek into the core areas you will require permission from the DFO Mudumalai WLS at Ooty. You will get it quite easily if you are affiliated with WWF, BNHS or any such organisation. The forest dept safaris are at 7am and 2pm. I dont know about elephant rides. www.forests.tn.nic.in/WildBiodiversi...ty/np_mnp.html can give more details. it is fantastic. You go with a guide and he tries to track down the animals so you can follow them. It is an incredible walk and you feel like another animal from the park. The day we went, there was an invasion of fireflies, millions of them. I simply loved it. From my experience in S.Indian forests, wildlife spotting during and immediately after monsoons have been quite bad. During the drier months, the chances of spotting something at the waterhole is a possibility. Getting a guide with the DFO's permission for a day trek would give you the best chance of spotting something exotic. Of course that wouldn't take you to the core areas of the forest! Have you considered TopSlip ?